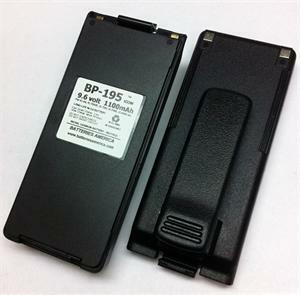 BP-195 : 9.6 volt 1100mAh rechargeable Ni-Cd battery pack for ICOM radios. Fits the IC-T2A, IC-T2H, IC-T2E, IC-A4, IC-F3, IC-F3S, IC-F4, IC-F4S, etc. Includes belt clip. Re-charges through the radio with original wall charger, or with our WC-AIC & BC-110AR Wall Chargers, or with a drop-in Desktop Charger (such as our EMS-196). Can also be re-charged thru the radio with a DC Power & Charge Cord, such as the CP-12L. This battery fits numerous ICOM radios for communication across many bandwidths (Commercial, Military, Land-Mobile, Amateur, Aviation, Search & Rescue). This BP-195 Ni-Cd battery is a good choice IF you have a drop-in rapid charger that is designated for Ni-Cd only. Pricing is for 1 battery pack. Picture shows both sides of a battery. WC-AIC: Wall Charger for ICOM handheld radios. WC-AIC: Wall Charger for ICOM handheld radios and batteries. Plug is Coaxial barrel, 3.5mm diameter, center polarity POSITIVE (+). Plugs into wall outlet. Output is 12VDC @ 200mA. BC-110AR : Wall Charger for ICOM - worldwide version ! 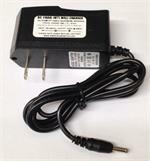 BC-110AR : Wall charger for ICOM HT radios. International version - worldwide AC input! Plug into 100-240VAC wall outlet; output is 12VDC @ 200mA. CBE-196 : battery eliminator for ICOM radios. Fits IC-T2A, IC-A4, IC-F3, IC-F4 etc. The CBE-196 is a clip-on DC mobile power adapter for ICOM IC-T2A, IC-T2H, IC-A4, IC-F3, IC-F4 radios, etc. Plugs into 12-13.8VDC socket; has coiled cord; clips onto back of radio. Battery shell housing has built-in noise filter & voltage regulator. BP-194: ICOM-brand Alkaline Battery Case for ICOM radios. Load with 8 x AA cells for instant hi-watt power. Fits IC-T2A, IC-T2H, IC-T2E, IC-A4, IC-F3, IC-F4. Replaces BP-194, BP-195, BP-196. 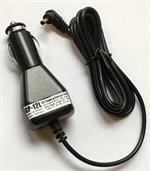 The CP-12L is a 12VDC Power/Charge cord for ICOM HTs. Output is 12VDC @ 2A. Provides High-Watt power, and can also charge battery packs thru the radio. CP-12L: ICOM-brand DC Power/Charge cord. Has built-in Noise Filter. Input 12-13.8VDC from vehicle DC socket. Output : 12VDC @ 2A. Fits radios such as IC-W32A/H, W31A/H, IC-T7A/H, T2/H, Z1A, T22A, IC-T8A/H, T81A/H, IC-A23/A5/A4, etc. BP-196 : 9.6 volt 2000mAh EXTRA LONG LIFE rechargeable Ni-MH battery pack for ICOM radios. Includes Belt Clip. Replaces original BP-195 or BP-196. Extended operating time, memory free! EMS-196 : Desktop Rapid-Smart Charger for ICOM-style BP-195 & BP-196 batteries. EMS-196: Desktop Rapid-Smart Charger for ICOM-style BP-195 & BP-196 (9.6v Ni-Cd & Ni-MH) battery packs. Provides safe, smart, fast-charging of both Ni-Cd and Ni-MH type batteries. Charges battery alone, or with radio attached.